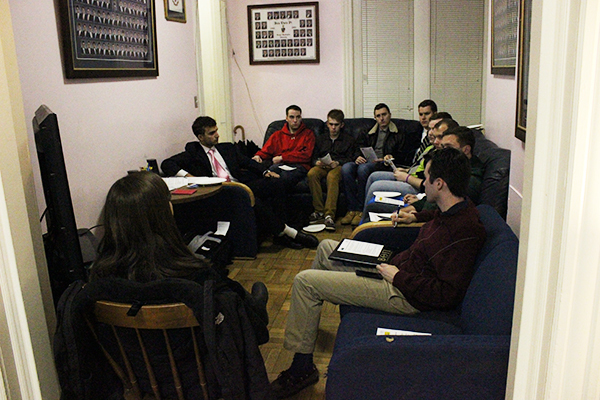 A coordinator from GW's Center for Alcohol and other Drug Education spoke with members of the Beta Theta Pi fraternity about preventing sexual assaults. Nearly a dozen Beta Theta Pi members sat inside their townhouse last week as one of GW’s alcohol education specialists explained the warning signs of sexual assaults – and how to step in to stop them. Through skits and videos of potential assault scenarios, the men talked about how to intervene without worrying about being judged or resented by their friends. The bystander intervention program was created by the Center for Alcohol and other Drug Education this semester, and has taken place in at least three Greek chapters so far. At the end of the two-hour session – which was created for all students, not just Greek members – the brothers took a pledge to step in if they see sexual assault or harassment on campus. “One of the messages was that you don’t need to be doing this big grand gesture to be a intervener,” Beta Theta Pi president Matt Zahn said. CADE staff members said they want students to understand that if they observe a potentially dangerous situation and don’t take action, no one else might either. Sexual assault education has become a larger part of Greek life with the help of Students Against Sexual Assault, and could become a requirement at all new-member orientation sessions this fall, said Peyton Zere, president of the Interfraternity Council. Police have investigated at least four alleged sexual assaults in GW fraternity houses over the last two years, including an incident in October 2012 at Beta’s 22nd Street townhouse. It was later marked as a closed case in the University’s crime log. City police also investigated an alleged sexual abuse at Tau Kappa Epsilon’s townhouse in March 2013 and two alleged abuses that reported at Phi Kappa Psi’s Townhouse Row housing in August 2012. Matt Scott, president of SASA, said more Greek chapters should offer the training because fraternities are more likely than other student organizations to face charges of sexual assault. His organization wants the University to require sexual assault prevention training for all freshmen during their first semester at GW, Scott added. “Greeks definitely recognize that their community needs the education to occur because statistically speaking, beyond GW, nationwide and anywhere, the Greek community is more susceptible to having sexual assault perpetrated within it,” Scott said. He said the Greek community has decided to act because of its increased focus on sexual assault within its chapters, forming a partnership that’s the first of its kind between the IFC and Panhellenic Association. Peer pressure on college campuses across the country can discourage students from speaking up or intervening, said Mike Dilbeck, the national bystander intervention expert who wrote the guidelines for GW’s training program. This article appeared in the March 24, 2014 issue of the Hatchet.